Laser Printers produce high-quality text and graphics (and moderate-quality photographs) by repeatedly passing a laser beam back and forth over a negatively charged cylinder to define a differentially charged image. Xerox Printers are cost-effective and offer professional-quality printing. 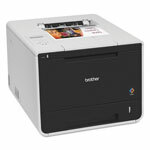 Laser Printers allow for robust, compact desktop performance. Laser Printers are designed to offer outstanding productivity, simplify workflow and save time. These feature-packed Laser Printers are an easy pick for busy offices.